The USS Wilkes-Barre is an advanced, deep-water dive to an exciting technical wreck. The USS Wilkes-Barre was a 608-foot-long Cleveland-class cruiser that was constructed in 1942 and commissioned two years later in 1944. It is the largest shipwreck in the Florida Keys and is quite an adventure considering that it rests at great depths. The uppermost sections of the ship can be reached at 140 feet of water, while lower sections are 250 feet deep. The Wilkes-Barre was active during World War II and was decommissioned in 1947—just five years after being commissioned. She waited in the naval harbor in Philadelphia until 1971, at which point the ship was taken to the Florida Keys. In 1972 explosive tests were done on the hull, breaking her in two. The stern sank quickly but it took an extra explosion to send the bow to rest on the bottom of the ocean. The two sections of the ship both serve as coral reefs now; the stern sits upright, the topmost sections at 140 feet, the lower sections resting at 250 feet. The bow lies on her starboard side. The uppermost portions of the bow are thus located further down at 200 feet, while the bottom parts are again at 250 feet. 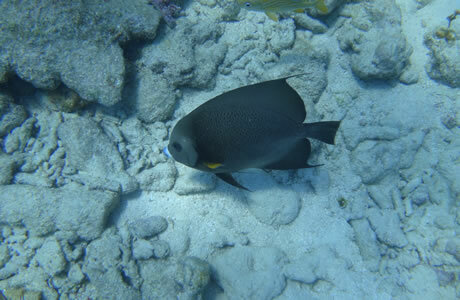 This is one of the deepest dives around the Keys, and is only recommended very experienced decompression divers. That is the only type of diving that can be done safely in this site. You'll find the shipwreck at N 24 28 28 W 081 32 60. If you're interested in naval ships and can manage the dive, this is a must-see site since you'll be able to take in one of the most impressive wrecks in the area. You may also encounter curious fish at these depths who are not used to humans and may be more sociable than fish closer to the surface.